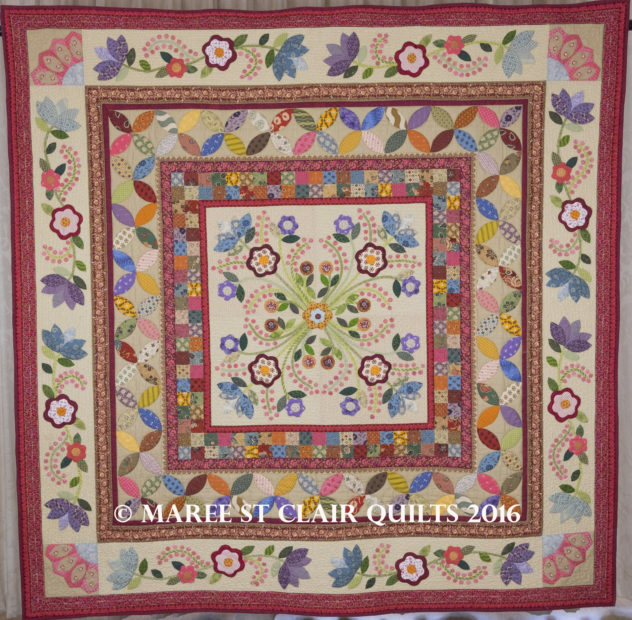 For a Trunk Show I will present a large selection of my Quilts, both pieced and Appliqued. Alongside the quilts I will chat about my design process and where I get my inspiration from. I am happy to combine this with a Workshop where we start with the Trunk Show or can plan it to suit your schedule. I will try to list here all the workshops I can offer but if there are any techniques your group would particularly like covered I am happy to discuss this further. A great workshop for those groups who have a number of beginners! We cover fabric choice, colour, rotary cutting, accuracy, seams, pressing and some of my personal hints and tips for successful patchwork. Participants will make a block they can turn into a cushion or continue to make a quilt. Comprehensive notes and a pattern supplied. Requirements list will be issued. 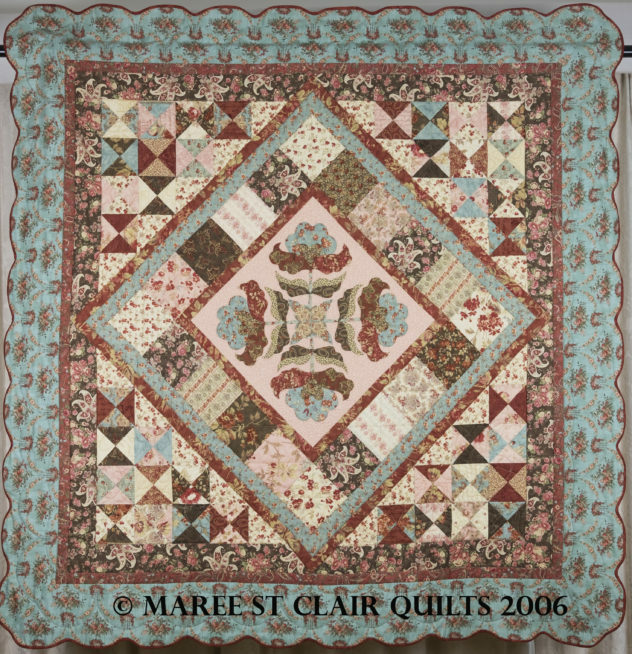 This workshop is structured to assist those who are having problems with an area of their pieced patchwork. I encourage students to bring along something they need help with. We will also cover, putting on borders, layering your quilt, quilting and binding. 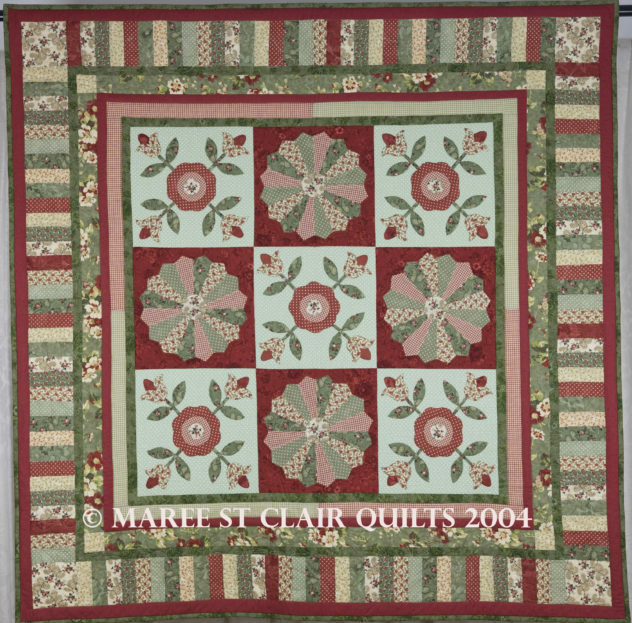 The quilting element is really a discussion only of the options available and the different methods available. I will demonstrate binding on a project. Comprehensive notes will be supplied. In this workshop we will cover the basic methods to machine quilt on a domestic machine. We will cover batting choices, layering and securing your quilt sandwich to assist in the quilting process. We will also cover marking your quilt top, straight line quilting with a walking foot, and simple meandering quilting. Comprehensive notes will be supplied and a requirements list will be issued. 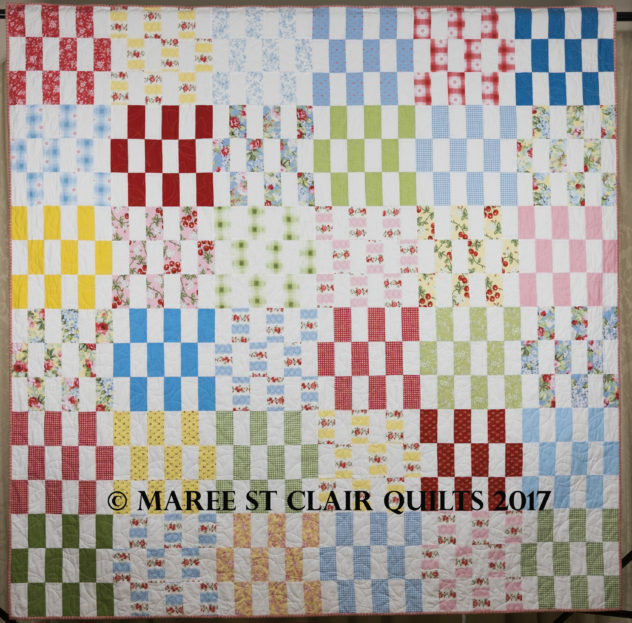 More Domestic Machine Quilting: Lets Have Some Fun! Building on the Basic Machine Quilting Workshop, in this workshop we will build on some effective machine quilting to use on your projects. There will be more straight line quilting and even some Trapunto! Comprehensive notes will be supplied and a requirements list will be issued. Sometimes you don’t want to just have a straight binding on your project! In this workshop we will discuss the various alternatives available such as Scallops, Knife Edge, Prairie Points etc. An interesting workshop! Let’s work with paper pieces to have a great project that is portable and the accuracy you can achieve is amazing. There is a multitude of designs available to use right from the Hexagon, Octagon, Pentagon & Diamonds (to name a few) right through to complex blocks all easily pieced using paper pieces. There are lots of techniques for attaching the papers to the fabric and I will help your students to find the one they are comfortable with. I will also demonstrate stitching to have the most invisible of seams. There is a choice of four different blocks to work on! Samples and requirements will be supplied in advance of the workshop. Comprehensive notes will be supplied on the day. 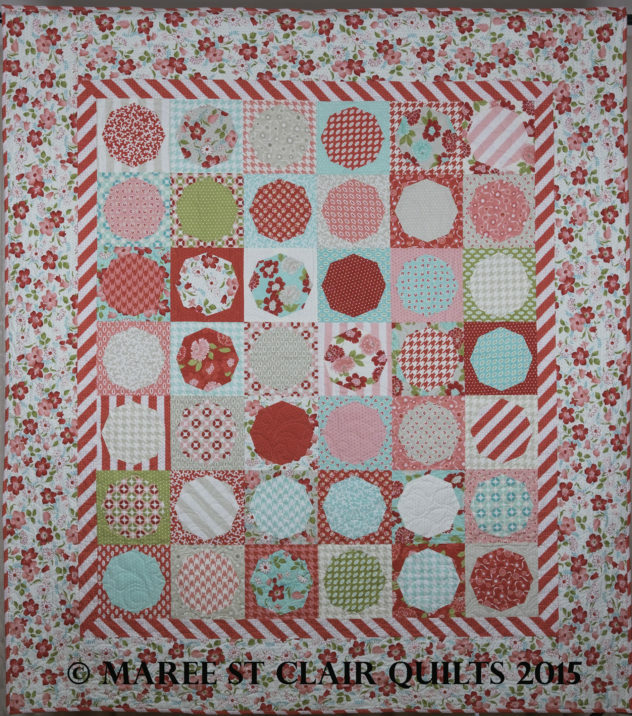 Simple Machine Piecing : Maisy! This workshop is great for a large group. They will need a Jelly Roll and 2.4m of a plain fabric of their choice. It’s a great fun day stitching and chatting! A pattern for the quilt is supplied as part of the workshop fee for each student. Requirements will be supplied in advance of the workshop. 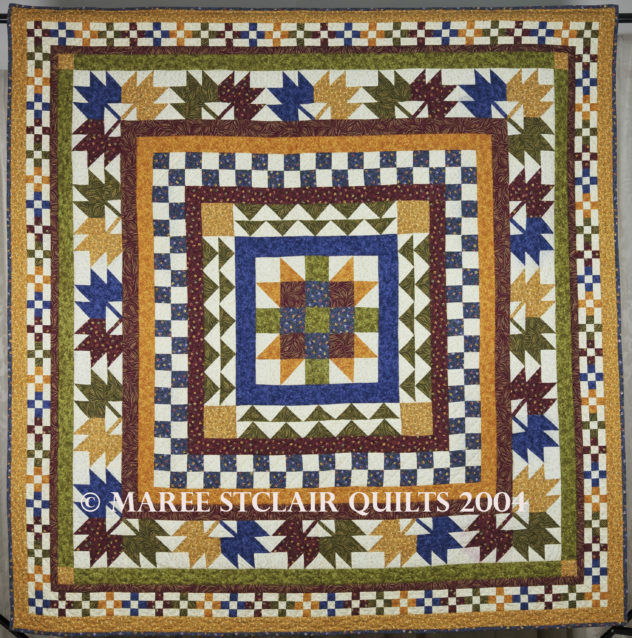 This is a great workshop to gain some accurate piecing skills for Half Square Triangles and Flying Geese. A pattern for the quilt is supplied as part of the workshop fee for each student. Requirements will be supplied in advance of the workshop. 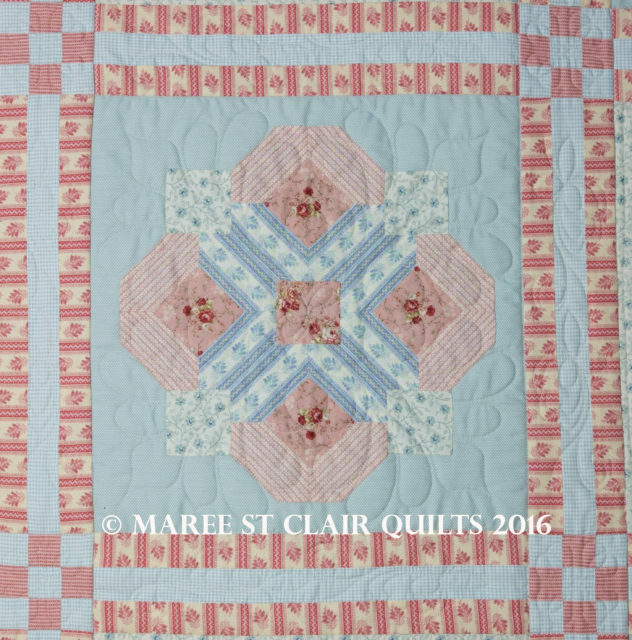 Learn how to make this quilt using 2 Layer Cakes and an Octagonal Template. A pattern for the quilt is supplied as part of the workshop fee for each student. Requirements will be supplied in advance of the workshop. Students will need to purchase the Octagonal Template on the day. They are $10 each. Here we will unlock the joy of Needleturn Applique! Simple shapes combine to create these pretty Applique Blocks. Students will need to purchase the pattern for this quilt as Full Size Applique Layout Sheets are supplied. This is $25. This also includes MYLAR templates for the Applique prepared ready to use. Comprehensive notes will be supplied on the day. These include instructions for Needleturn Applique! Requirements will be supplied in advance of the workshop. Applique & Dresdens: Folk Art Christmas! Simple shapes combine to create these pretty Applique Blocks. 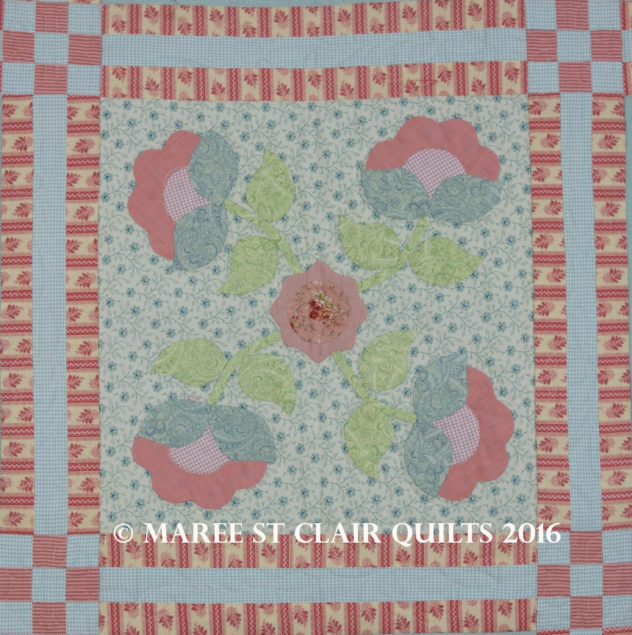 Alternate them with the Dresden Plate blocks to create this quilt. Students will need to purchase the pattern for this quilt as Full Size Applique Layout Sheets are supplied. This is $25. This also includes MYLAR templates for the Applique & Dresden Plate prepared ready to use. Comprehensive notes will be supplied on the day. These include instructions for Needleturn Applique and making Bias Stems. A Little More English Paper Piecing and some Applique: Eloise! Needleturn Applique & English Paper Piecing! 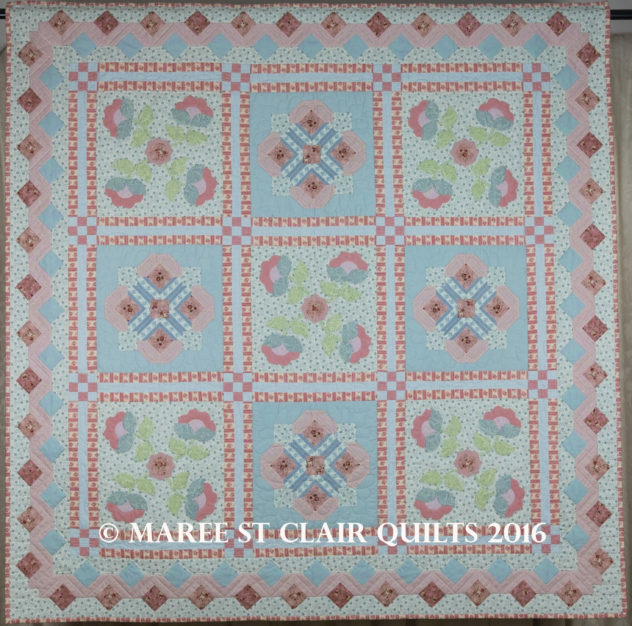 Alternate the blocks, add some interesting sashing and then an English Paper Pieced Border completes the quilt. Students will need to purchase the pattern for this quilt as Full Size Applique Layout Sheets are supplied. This is $25. This also includes MYLAR templates for the Applique. 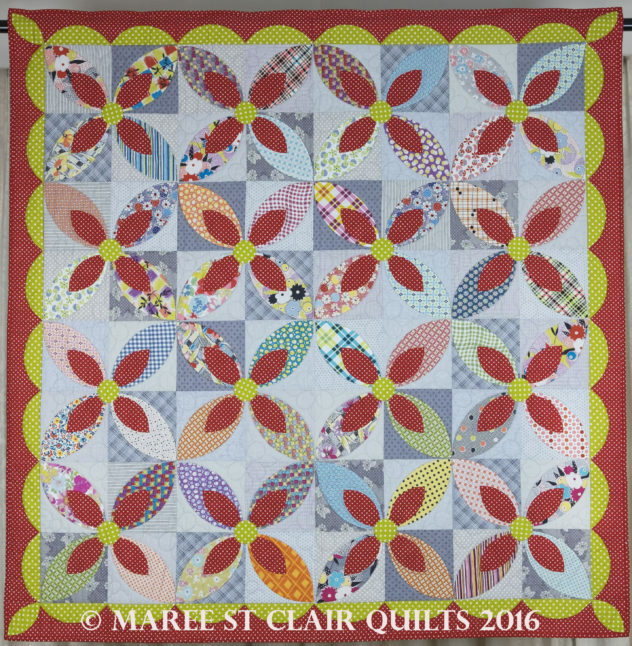 A separate starter kit for the Paper Pieced blocks is available for $15 which includes an Acrylic Template. Comprehensive notes will be supplied on the day. These include instructions for Needleturn Applique and making Bias Stems. Not for the faint hearted but a wonderful quilt to complete. In fact it looks complicated but really it isn’t! Lots of applique but mixed with piecing and playing with your border fabrics and using them to great effect. Students will need to purchase the pattern for this quilt as Full Size Applique Layout Sheets are supplied. This is $35. This also includes MYLAR templates for the Applique. Comprehensive notes will be supplied on the day. These include instructions for Needleturn Applique, Bias Stems, Mitring and Cutting Fussy Borders. I am happy to discuss a rate that is suitable to the situation, the number of students and the requirements. This includes all comprehensive notes for students as listed in the different workshops. I have noted where it is a requirement of the workshop that students purchase additional items. I will make a 10% contribution to the Shop or Group from the sales of these items. I require 50% deposit on booking and the balance a minimum of seven days prior. If you need to cancel the Workshop less than one month prior then I will need to retain $100 but the rest of your deposit will be returned. If you wish to alter the date then we can negotiate this charge. If the cancellation is more than one month before the date then I will refund any monies paid in full. If the Workshop is to be held within a 50km radius of my home in Strathfieldsaye, Victoria, Australia then there is no charge. For distances further than that I am happy to negotiate an allowance to cover costs to me. I am happy to travel locally, within the state, interstate and indeed internationally! If there is a large distance to travel then I appreciate being accommodated overnight prior to the workshop and afterwards if necessary. I don’t need five star! I do however appreciate clean comfortable accommodation with ensuite. If it is a retreat situation then I am more than happy to camp with everyone else. Alternatively, my husband and I have a caravan so if the situation works, even interstate, then we are happy to bring it, needing then only a powered site in the local caravan park! I am happy to discuss! I have a range of patterns available, not just those listed in Workshops. There are also template sets and paper pieces available for sale. In a quilt guild situation I would love the opportunity to bring these. For the shops I am happy to discuss wholesale sales with you! Thank you for taking the time to read through my offerings and again I am happy to design a Workshop to fit your needs. Look forward to catching up with your group!